There are books out there on every baby-related topic imaginable, but what about one that helps you plan your return to work, and ease concerns and fears about the transition so you can focus on your child? Back to Work After Baby: How to Plan and Navigate a Mindful Return from Maternity Leave fills this much-needed gap, introduces you to a community of other returning-to-work mamas, and empowers you to make calm, thoughtful choices. Whether you are a brand-new mom or you had your second or third child, Back to Work After Baby will inspire you with new ideas on how to approach heading back to work with a healthier mindset, tackle the myriad of logistics, view your leave and return as a leadership opportunity, and commit to staying in community with other working mamas. A portion of the proceeds from the sale of this book will benefit First Shift Justice Project and its mission to empower low-income pregnant women and parents to safeguard the health and economic security of their families by asserting their workplace rights. The mental bridge between maternity leave and returning to work is a tricky one to cross. That’s where Lori Mihalich-Levin comes in. The working mama guru will inspire you to transition from diapers to deals in a completely calm approach. A battle cry for mothers that aspire to lead in their fields, Back to Work After Baby is every ambitious new mother’s bible. Young mothers reading these chapters will feel themselves in the company of a sympathetic friend. A lively, readable trove of invaluable personal and practical advice for new moms. This book is what every new mother needs, but just doesn’t know it. It is a must-read for practical reasons, with invaluable coping tips, and for emotional reasons, reminding us women that we are not alone. There is a sisterhood out there, and Lori’s book gives permission and a path to tap into it. Bravo! It’s all here! 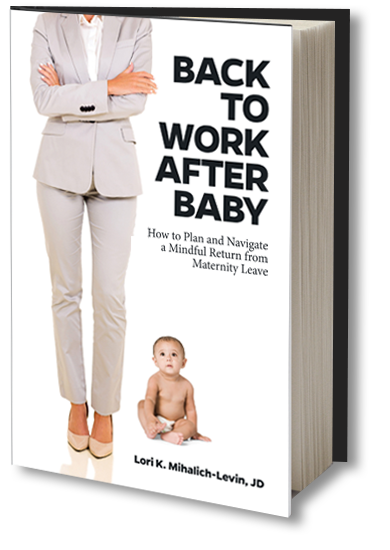 In Back to Work After Baby: How to Plan and Navigate a Mindful Return from Maternity Leave, Lori Mihalich-Levin pulls together everything you need to navigate the tricky territory of motherhood in today’s workplace. This guide is both intensely personal and very practical, crammed with real-world advice from negotiating your time off to pumping at work. 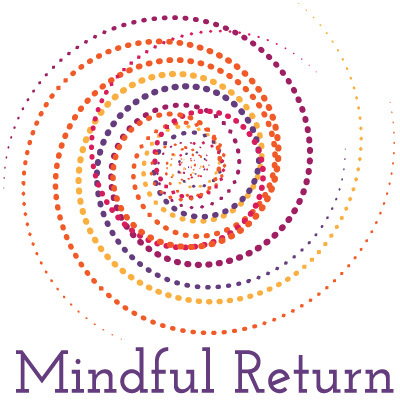 My favorite section deals with making your return work for you, leveraging your maternal interlude so that you come back more confident, capable, and calm than when you left. No matter where you work or what you do, this book is for you. Any parent wanting to make the most of their transition back to work post-baby will find immense help in this book. It is packed with specific tips, thoughtful advice, and unexpected things to think about in order to make the most out of the journey. This book is a treasure for parents wanting to go through this period in the healthiest and most fulfilling way possible, for them and their families. Andrea Bonior, Ph.D., Washington Post "Baggage Check" columnist and author of "Psychology: Essential Thinkers, Classic Theories, and How They Inform Your World." They say that parenting doesn’t come with an instruction manual, but now that Lori’s book is out in the world, going back to work after maternity leave absolutely does! What’s more, it’s not just a book of suggestions. Lori literally invites you into her village, as the book features advice and experiences from her friends, teachers, and students. What a perfect way to illustrate one of Lori’s key messages: the importance of finding your tribe and supporting one another through this special – but challenging – time. I’m going to lift up my village by sharing this book with all the working mamas and mamas to be I know. By day, a policy advisor to a health technology start-up; by night, a yoga instructor and convener of Jewish mamas. 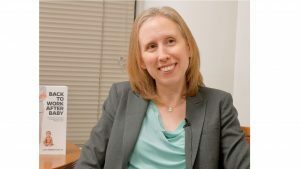 Lori Mihalich-Levin’s new book, Back to Work After Baby: How to Plan and Navigate a Mindful Return from Maternity Leave, is exactly what you have been waiting for to help you tackle the challenges and the anxieties of the early years as a Working Mom. For those of us who did this thirty-plus years ago, we appreciate it as a love letter to the young mothers in our families and our circles of friends, who do need it and whose dreams and aspirations we care about so much. Lori’s unique clarity on these issues, together with the insightful contributions from other professionals and experts, comprise a virtual primer for how to get the most out of early motherhood and still contribute the most to your profession. The information on the leadership opportunities for and capabilities of working mothers was particularly compelling for me and my work. Working Moms encourage the best from their families and from their colleagues, and they lead the way as excellent role models and innovators. 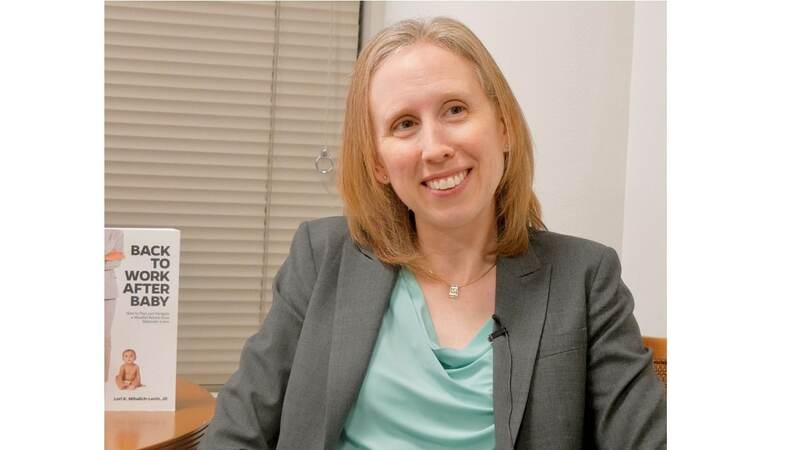 Their legacies will go a long way toward improving law firm cultures, especially, as Lori Mihalich-Levin demonstrates. Job well done, Lori! Back to Work After Baby is my pick of the year for best management book. This is the book that I’m recommending to moms and bosses. Why? Read the section on Leave and Leadership. Moms, pull up a chair, make room for the boss, pour yourself a hot cup of tea and join in the conversation with Lori as she gently and expertly guides the way back to work and teaches you how to manage the trip. By the time you finish reading you and your boss will have made a friend in Lori. Lori’s book, “Back to Work After Baby” is a much needed exploration into the challenges of returning to work as a first-time mother. The book feels like someone carrying YOU along on your journey of juggling a career and baby, too. I wish this book had been given to me when I returned to work. Lori’s insights and tips are so gentle and easy that any new mom can feel amazing at work and at home.